South Ramsey A retained the Division One title by beating Port St Mary A 6-4. South have been a dominant force all season and fully deserve to win back to back trophies and will look forward to competing in the 2018 World Club Challenge and going for a hattrick of wins next season. Marown A pushed hard in the second half of the season to chase down South Ramsey but despite their best efforts settle for second place finishing eight points behind the champions. Onchan A had already guaranteed third position but Douglas A, Port St Mary A and Peel Sunset A were all fighting for fourth position. Peel slipped to a 8-2 defeat away to Onchan A leaving them to finish sixth. 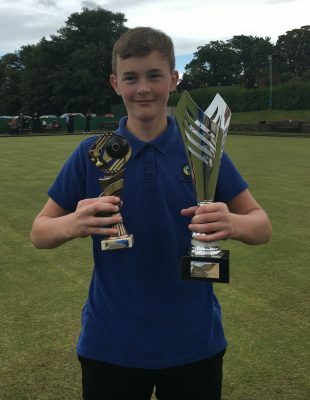 Douglas A picked up a 8-2 win over North Ramsey A but crucially Port St Mary A picked up four points in their defeat at South Ramsey A pipping Douglas by a single point to claim fourth position. Castletown B finish bottom following their 8-2 loss at Marown A but Ballaugh A, Douglas B or Port Erin A could still finish in the bottom two. Douglas B sat out Wednesday having already completed all their matches so were sweating on the results from their relegation rivals. Port Erin A who with only a few games to go were rock bottom found good form in their final few matches finishing the season off by defeating South Ramsey B 7-3 and keeping them in the top flight. That left Ballaugh A, they went to Castletown A knowing they needed three points to jump Douglas B and save their season. On the night they lost two games 21-18 and another 21-17 and could only manage two wins losing 8-2 on the night and leaving them with Castletown B at the bottom. Colin Kelly collected the division one merit on the final day of the season with David Bradford finishing second and Trevor Quayle third. 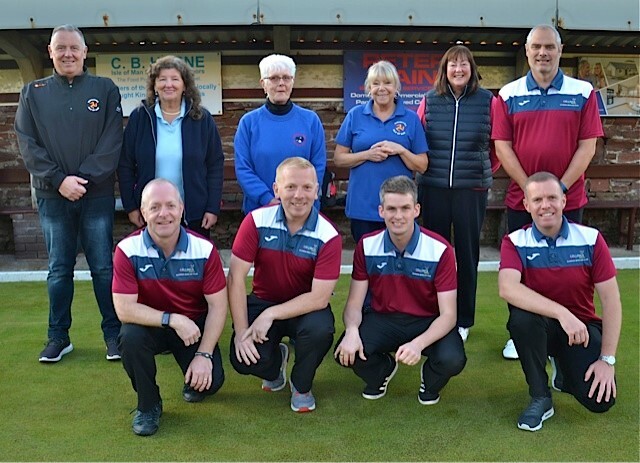 Marown B had already confirmed themselves as Champions and finished the season with a 5-5 draw at Peel Sunset B. Onchan B finished seven points behind the men from Crosby with Nobles B third and a further 20 points back. Nobles B have enjoyed much success this season incredibly finishing nine points ahead of their A team. In their final matches Nobles B went down 7-3 away to Port St Mary B and Nobles A defeated Port Erin B 9-1. Douglas C finish bottom along with Onchan C.
The division two merit came right down to the wire and Steve Crampton finished top of the shop signing his season off with a 21-9 victory. Kerry ‘Bod’ Boland finished second. Division three had a great finale with Ballaugh C leading the division by two points ahead of Peel Sunset C. With both teams having one hand on the trophy the fixture list happened to throw them together on the last night of the season. Ballaugh travelled to Sunset City and the match was close, only separated by eight chalks but it was Peel who won 7-3 and took the third division trophy. The division three merit was also just as close, Dave Smith led the way but three other people were waiting to pounce should he have lost. Away at Ballaugh B Dave won 21-7 and collected the merit in only his second season of league bowls. So the curtain has fallen on another fantastic season of league bowls. We thank our Sponsors Ellan Vannin Fuels for their continued support along with all the people behind the scenes that help with the running of the league. South Ramsey held the Income Plus Group sponsored Jim Senior Fours on Sunday. There was a good entry of 10 teams of four taking part, with teams selecting their players to play a doubles game and two singles games to take on opposing teams, with teams rotating at least one player from the doubles matches in each round. The eventual winners were the team named ‘Getting the Job Dunn’ which was made of Paul Dunn, Colin Kelly, Tom Kelly and Neil Withers, who defeated the South Ramsey team ‘The Chuckers’ in the final, with the team being made up of Dave ‘Dido’ Kelly, Stefan Kelly, Alan Moore and Steven Waters. In the Doubles match Neil Withers and Tom Kelly defeated Steven Waters and Alan Moore 21-16, whilst in the singles Stefan Kelly beat Paul Dunn 21-12. In the other singles game Colin Kelly had a strong 21-8 win over Dido Kelly to ensure the team were in fact ‘Getting the Job Dunn’ to secure the title for his team. Losing out in the semi-final to the runners were ‘The Teacaddies’ made up of Lynda & Derek Cadamy, and Philippa & Alec Taylor. Losing out in the other semi-final to the eventual winners were the North Ramsey team ‘Smarticus and the Gladiators’ made up of Tony Smart, Allan Callow, Steve Parker and Steve Walmsley. 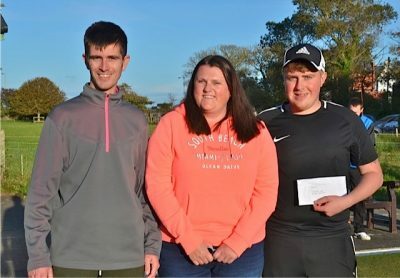 The presentation was made by Chas Grills, who thanked the sponsors Income Plus Group, all those who entered the competition and braved the conditions, the Ladies for the refreshments and the club members who assisted throughout the afternoon. The Champion of Champions was held at the Waterloo over the weekend with the Men’s event taking place on Saturday. South Ramsey’s John Kennish qualified through winning the Manx Championship earlier this year, however Kennish lost out in his first game to Gareth Herbert 21-12. The eventual winner was Michael Beer who defeated teammate Callum Wraight 21-11 to secure his first Champion of Champions title. In the semi-final Wraight ended the challenge of hot favourite Greg Smith 21-20 in a fascinating game that will live long in the memory, whilst Beer defeated the newly crowned Autumn Waterloo winner Wayne Ditchfield 21-16 to book his place in the final. On Sunday in the Ladies event there was more South Ramsey representation, with Shelley Kennish (Manx Championship winner) and Jenny Moore (September Pre Festival winner) who managed to get a late entry due to another player double qualifying for the event. Kennish won her first game with a 21-19 victory over Lisa Kerford, whilst Moore won by an even closer score line of 21-20 over Jo Webster. Kennish just lost out 21-18 to the experienced Gay Cooper in the second round, whilst Moore booked her place in the quarter finals courtesy of a strong 21-12 win over Kellie Hill. In her quarter final game Moore had the tough challenge of facing Emily Kernick, but battled well to only just lose out 21-17. Losing out in the semi-finals were Nicola Boulton and Emily Kernick. The eventual winner was Lynsey Gorman who beat Angela Gaut 21-9 in the final. The Ellan Vannin Fuels Mixed League was brought to a conclusion on Thursday evening. The competition commenced in early May, with 14 teams entering the competition, the teams were split into four groups playing each team in their group home and away, earning two points for a win on chalks, one for a draw. The winners with the most points from each group then qualified for the semi-finals. The four group winners were South Ramsey A, Port St Mary A, Marown A, and Onchan A. The draw for the semi-finals put South Ramsey A v Marown A and Port St Mary A v Onchan A. The semi-final fixtures were held on neutral greens. Last year’s winners South Ramsey were disposed of comfortably on Noble’s one by Marown, who had a convincing win by 39 points. The other semi-final was a lot closer with Port St Mary booking their place in the final winning by 10 points to book their place in the final. 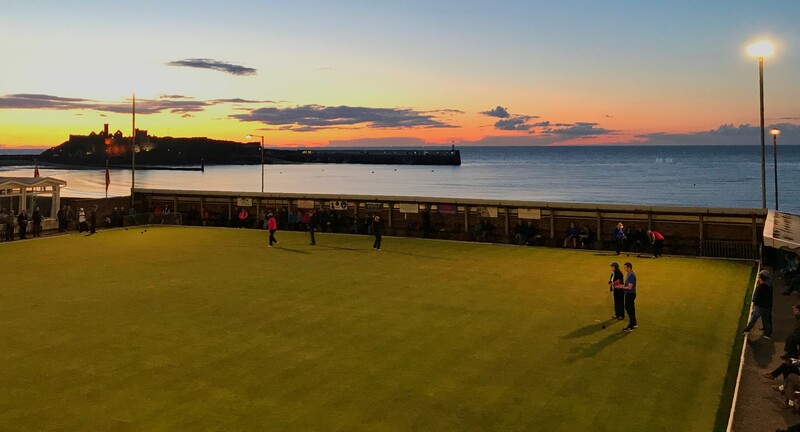 The final was held on a fantastic Peel green, who were able to show off their new floodlights, against the backdrop of a stunning sunset. The final got underway with Matthew Keggen first off for Marown, with a 21-18 win over Paul Skelly in a good quality and entertaining game to watch. Second game off was Phil Kelly who overcame the strong challenge of Chris Price to win 21-14 to extend Marown’s lead to 10 chalks. The third game off was Dan McCabe who had a comfortable 21-12 win over Mary Alderson, to reduce the deficit to one chalk for Port St Mary. This was swiftly followed by Neil Withers who won 21-8 defeating Margaret Tasker to extend Marown’s lead to 14 chalks. The last game of the first blocks on the green went to the wire, with Wayne Roberts just getting home with a 21-20 victory over Philippa Taylor, reducing the deficit to 13 chalks. The second set of games all became vital, with Jayne Kneen leading 15-6 over Paul Dunn, with Dunn having to dig deep to get back into the game, however Kneen managed to get over the line with a 21-15 win to reduce the deficit to seven points for Port St Mary. Ewan Cooil put in a good performance for his team to turn the match on its head with a 21-5 win over Shirley Whelan to swing the match in favour of Port St Mary for the first time on the night by nine chalks. In the penultimate game, it was a blockbuster of a game with the men currently sat first and second in the division one merit facing off. After a slow start Colin Kelly built a commanding 15-6 lead over Trevor Quayle, with Kelly finishing the game off 21-13 to reduce the deficit to one chalk for Marown. At this point the last game of the evening was finely balanced between Lil Smith and Patricia Bull, with the match score being 4-4 on games only a win for Marown’s Lil Smith would do. The game could so easily have gone either way, however Smith wasn’t to be denied and became the hero of the night for her team, getting over the line 21-19 to secure a win by one chalk for Marown, who in doing so secured their first Mixed League title and are the only fifth team to take the title since its inception in 2005. At the conclusion of play after what was a thrilling final, the presentation was made by the President of the Men’s Association Clare Cooper, who congratulated Marown on their win, thanked the sponsors Ellan Vannin Fuels for their continued support of the competition, Peel for hosting the final, and the spectators who came to support. We’re heading into the final of week of the summer bowls season. It seems to have been a great success extending the season through September with clubs and players able to enjoy more bowling before the weather turns for winter. There is still plenty to play for in the Ellan Vannin Fuels sponsored Men’s Leagues with Division and Merit titles up for grabs. Starting with division one current champions South Ramsey A look to have done enough to secure back to back titles holding a comfortable 12 point lead over Marown A. The battle at the bottom of division one rages on with Castletown B throwing Ballaugh A and Douglas B back into the relegation battle following their 8-2 win over Douglas B last week. At the bottom Port Erin A sit on 53 points, Castletown B 59, Ballaugh A 60 and Douglas B 64. Douglas B look safe on those points but they have played a game more than their relegation rivals and sit out on Wednesday. It will be season defining game when they make the trip up north to face South Ramsey B on Monday knowing they need to pick up points to distance themselves further. Port Erin A who are rooted to the bottom of the league have two home games this week, first on Monday against fellow relegation candidates Castletown B and South Ramsey B on Wednesday. 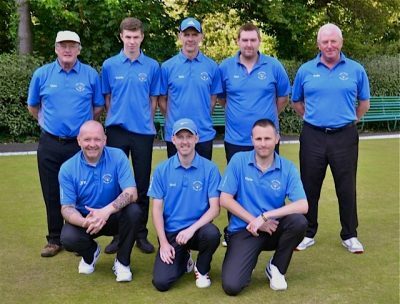 Ballaugh A collected an important two points when they took the aggregate in a 6-4 win over Port Erin A last week. With a tough home match against Marown A followed by Wednesdays away trip to Castletown A they will have their work cut out to stay in the top flight, which they have been a part of since winning the division two league in 2008. Castletown B who face Port Erin A on Monday then go to Marown A who have only dropped six points out of the available 50 in their last five home matches. Their Monday night encounter with Port Erin A could be the make or break game for the Balley Chashtal Men who were promoted only last season. Division two and three have only one game remaining which are being played Monday or Tuesday night. Marown B have already confirmed themselves as Champions as Onchan B had to bring their match forward to Friday and required a 10-0 win to have any hope of winning the league. They could only manage a 8-2 win over their C team confirming Marown B as league winners. At the bottom of the table Douglas C who have struggled this season will finish bottom with Onchan C finishing above them. It has been tight at the top of Division three for most of the season with Marown C, Peel Sunset C and Ballaugh C exchanging blows and places along the way. 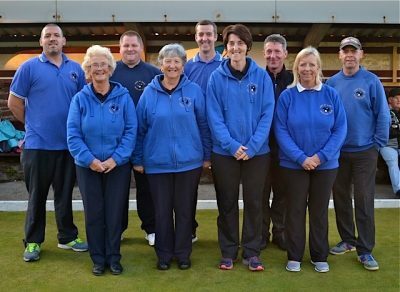 Marown C have fallen off the pace but should they hang on to third place it would be a great achievement in only their second season of bowls. This leaves two teams Ballaugh C 126 points and Peel Sunset C 124 points. Incredibly the two teams meet on Tuesday at Sunset City which will provide a fantastic backdrop to the climax of division three. In the League Merits. Trevor Quayle has been top of the division one merit for virtually the entire season having lost only one game 21-18. Chasing him are Colin Kelly, David Bradford and Neil Withers who could all still win the merit with two games to play. Steve Crampton has already confirmed himself as division two merit winner with Kerry ‘Bod’ Boland runner up. The division three merit has four players tied on 16 wins with chalks dropped separating them. Dave Smith, Paul Quirk, Arthur Moore and Ian Moore will all await each others results to find out which one has grabbed the merit. Good luck to all the teams and players for the final weeks bowling. Following the success of the Juniors, there was definitely a feel good factor around the green, with the Ladies and Men’s event immediately following the Juniors. The Ladies event was an invitational 16, with the Men’s event being an invitational 32. The eventual winner in the Ladies competition was the current Ladies Manx Champion Shelley Kennish, who overcame the challenge of teammate Lyn Bolton to win 21-20 after being 20-16 down. Kennish came through her semi-final game with an assured win over last years winner Elaine Moore (South Ramsey), whilst Bolton had to dig deep with a 21-17 win over Chris Price (Port St Mary). Kennish didn’t have it all her own way though, having to battle back from 19-10 down in her quarter final with Rebecca Teare (Nobles) to run out with a 21-19 victory. The other losing quarter finalists were Clare Cooper (Nobles), Philippa Taylor (Marown), and Gill Dixon (South Ramsey). Glenn Boland carried his good form into the Men’s Manx Masters by winning his first game, demonstrating that he is one to watch out for in the Men’s game. Not to be outdone by his daughter Shelley, John Kennish who is also the Men’s Manx Champion managed to retain the Men’s Manx Masters, with a resounding 21-6 victory over Neil Withers (Marown) in a good quality final. In the semi-finals Kennish ended the challenge of Colin Kelly (Marown) with a 21-13 victory, whilst Withers booked his place in the final with a 21-15 win over Stuart Garrett. 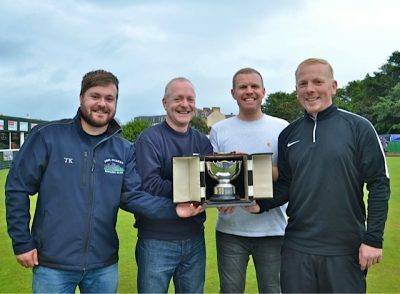 Losing out in the quarter finals were Paul Skelly (Port St Mary), Dave ‘Dido’ Kelly (South Ramsey), Nathan Cooil (Castletown) and Phil ‘Rambo’ Kelly (Marown). At the conclusion of the competition thanks were given to Feltons for their continued sponsorship of the Ladies and Men’s competitions, the South Ramsey Ladies for the excellent refreshments provided throughout a long day, those who helped run the competition and prepare the green. 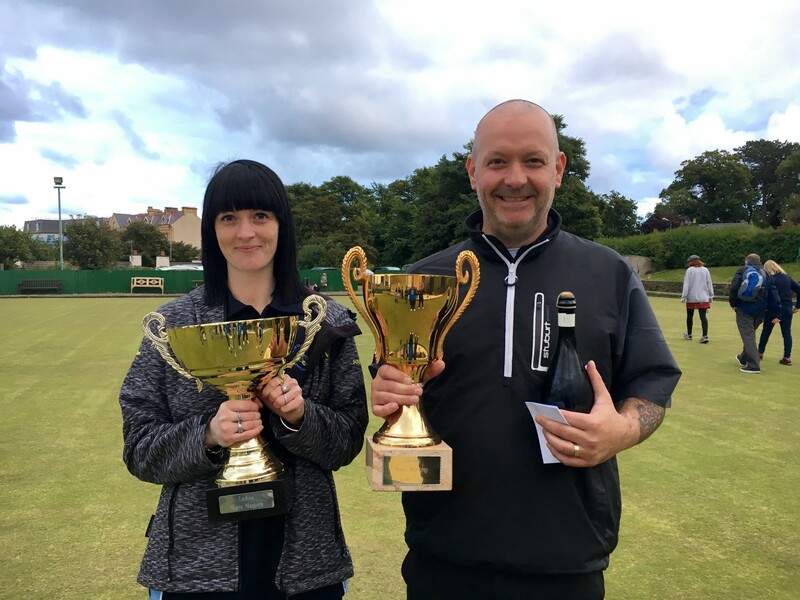 Finally good luck to Jenny Moore, Shelley Kennish and John Kennish who will all be representing the Island next weekend (23rd/24th September) in Blackpool at the Waterloo in the Champion of Champions by virtue of their success in other competitions. An Entry of 32 players (16 pairs) played at Port St Mary Bowling Club. The 32 players were split into 2 groups, A and B, based on the league merit tables and which league the individuals play in, with group A being mostly 1st division bowlers. One player was drawn from each group to make up the teams. This made for many close matches in every round of the competition, including the final which was won 21 – 20 by Jordan Cain & Nathan Hamilton against James Teare & Glenn Boland. Losing at the semi-final stages were Alan Moore & Tom Collins and Glynn Hargraves & Derek Kneen. With the weather also behaving itself, a very enjoyable afternoon was had by all. At the Presentation, the President Of P.S.M. Bowling Club Ken Karran thanked the sponsors Friends Provident, the greenkeeper Ewan Cooil, the Ladies catering team, and everyone else that helped on the day. Ken Karran then introduced Katy Williams of Friends Provident to present the prizes. This open was added to this season’s schedule after some extra dates became available. After a lot of good feedback on the day from the players and spectators it is hoped that event will go ahead again next season.